ChuChu Donuts is where you can customize your donuts with different kinds of cream or jelly. 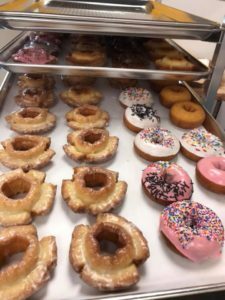 Come and see a wide selection of soft, moist, fluffy raised and cake donuts made fresh every day from scratch. ChuChu Donuts welcome all ages. Seriously, No Nuts! Our donuts are made fresh in the morning, guaranteeing delicious, fluffy, and soft donuts to start off your day. Choose from Bavarian Crème, Chocolate Fluffy, Vanilla Fluffy, Strawberry, Raspberry and Lemon filling -- ChuChu Donuts provides tasty options to take your donut to the next level. If you have peanut allergies, there’s no need to worry! We do not use peanut products on any of our ingredients or toppings. 25 dozen yesterday morning for everyone at American Enterprise. They were a huge hit for all! So many excellent comments from our employees. These donuts were still warm and fresh and beautifully decorated with every imaginable topping in lots of different colors. Thank you so much for taking our order when the other donut place in wdm could not. Lots more people know about Chuchu in Ankeny now! Great donuts! Hands down best donuts in the Des Moines area and possibly the country! Seriously, don't bother going anywhere else I've done the research for you! Service is so friendly, donuts are fresh and wonderful. Go now!! ChuChu donuts are really really good. Like, insanely good. Try the Iced Long Johns with the cream filling. Amazing. And their traditional style donuts. Just awesome. Visited today for the 1st time. Had a chocolate frosted long john filled with white creme. Amazing! I also had an old fashioned glazed that was light and delicious. Owners gave me free glazed donut holes. Hot coffee and fresh baked donuts. Case was refilled repeatedly throughout the morning. Highly recommend!